I usually leave Ventura reviews for Mikey, since he’s local and all. But last Friday night I got an opportunity I just couldn’t pass up. My friend Tiffany happens to be friends with the executive chef at Cafe Fiore and since I was craving a little decadence, I decided to give Fiore the EatMeCalifornia treatment. What ended up happening was that EatMeCalifornia got the Fiore treatment. We arrived right on time for our 8 o’clock reservation and were whisked away to a nice little booth in the back of the restaurant. The place was packed with 20-30 somethings drinking cocktails and having a great time. I instantly loved the vibe of this place and it didn’t hurt that it was gorgeous too. The look is rustic, with high ceilings, dark wood and wine racks everywhere. It reminded me a lot of what the guys over at Cafe Firenze were trying to accomplish, but this smaller, more intimate space carries it off even better than Fabio and his crew have managed. As we ordered our cocktails, a caipirinha for me and a bellini-tini for Tiffany, we were informed that the chef had selected an appetizer for us to sample. What he sent out ended up being the highlight of my night. This trio of appetizers blew me away. 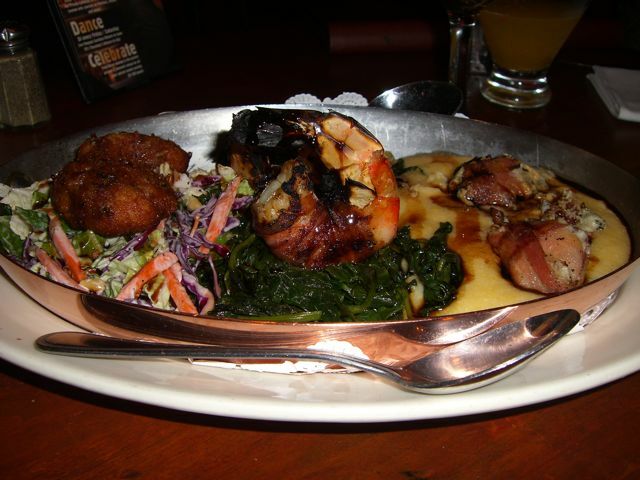 It started with a pancetta wrapped blue cheese served over polenta, then moved to prosciutto wrapped jumbo shrimp over sauteed spinach and then ended with crab cakes over a napa slaw. The blue cheese was my favorite, as the cripy pancetta combined with the richness and sharp taste of the blue cheese to make my taste buds whine for more. The shrimp were huge and cooked perfectly and the crab cakes were small but tasty. I also have to give them bonus points for the “garnish” items in the dish, which ended up being delicious on their own. 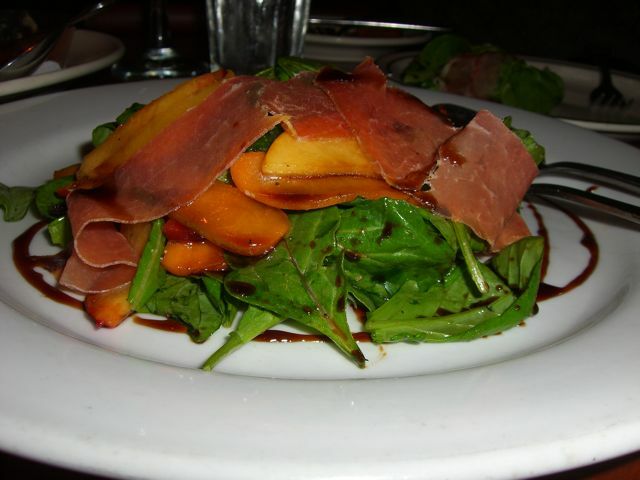 Our next course was a spinach salad with fresh fruit, prosciutto, and a balsamic reduction. It was juicy and delicious and did a great job of cleansing the palate while we debated what to get for our dinner course. After we devoured the salad, Chef Ken sent out a sample of his butternut squash tortellani, which was like a ravioli, and effortlessly combined sweet and savory into one simple bite. For our dinner, we settled on the special pizza of the night. It was an interesting combination of ingredients including prosciutto (sense a theme here? ), figs and gorgonzola and mozzarella cheeses. The presentation was appealing and the unique flavor combination certainly did not disappoint. Gorgonzola is a very strong cheese, but the interesting thing about this pizza was the perfect amount of mozzarella that was used to cut that strength, producing a creamy and semi tart taste in the pizza. 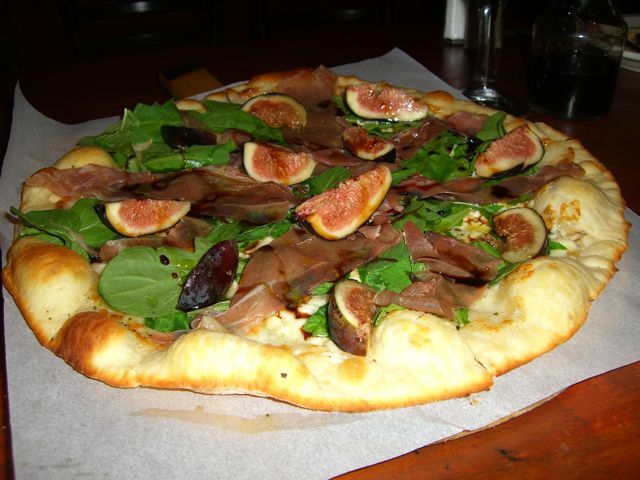 This is not the pizza for you if you don’t like figs, but if you do, this is a must-try. The figs were fresh and sweet and the prosciutto was paper thin. The thin crust was not overdone at all and really let the ingredients speak for themselves. All in all, I thought it was an interesting idea and executed well. We were definitely looking forward to dessert because Ken was Fiore’s pastry chef before he took the head spot. He came out and recommended a couple desserts and we caved and got them both. 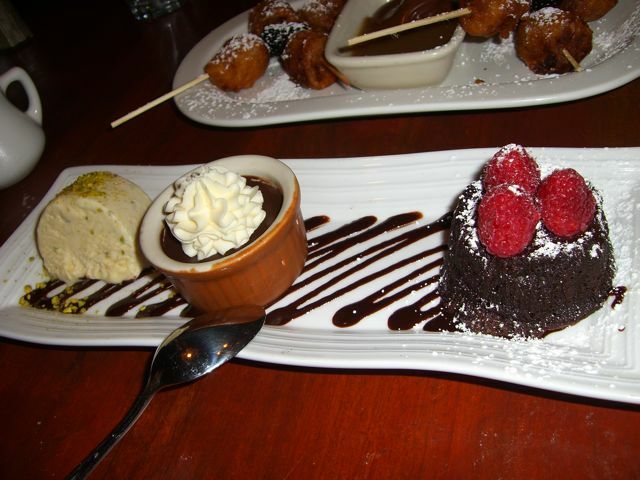 The first dish was a trio of chocolate delights. It included a white chocolate and pistachio dessert that can best be described as a richer version of ice cream. The middle dish is a curious blend of a chocolate mousse and chocolate creme brulee, which I eventually decided was my favorite of the three. The last dish on the plate was a flour-less chocolate cake with fresh raspberries. All three were outstanding and it was almost impossible for me to choose just one as a favorite. Luckily, I got to eat all of them. The other dessert we tried was the banana fritter with butterscotch sauce and nutella. 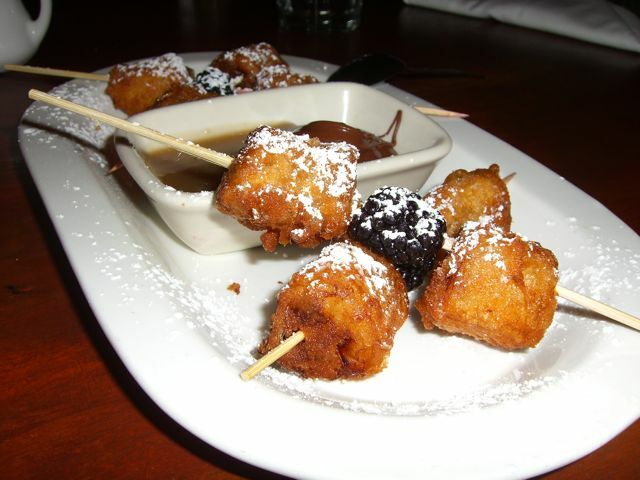 The fritters were crispy and surprisingly light, as was the butterscotch sauce. I am not a huge fan of nutella, so I basically ate all of the other sauce and only sampled the nutella sparingly. If you like banana, you’re sure to love this dessert. The fresh blackberries are a nice touch and as far as desserts go, it isn’t overly sweet. In fact, I could probably eat the fritters by themselves and stay relatively guilt free. This meal was truly wonderful and I will certainly be going back. But the food isn’t all that Fiore has going for it. It’s also one of Ventura’s best in terms of nightlife. They have a huge patio, with a separate bar, and their drinks are the real deal. They have both DJs and live bands on the weekend and the cover band that I heard on Friday was extremely good. It probably didn’t hurt that they could switch seamlessly between Incubus and the Black Crowes. In my opinion the prices are extremely fair for the quality of the food and the excellent service. This is a great place to take a date and a fun place to let loose on the weekend. Make sure you call ahead for a reservation because Fiore can get very busy on almost any night. I guess that’s what comes with being the best thing going in Ventura these days. Great post, you really captured the meal. You must have THE BEST memory, because I totally forgot about the squash tortellini.